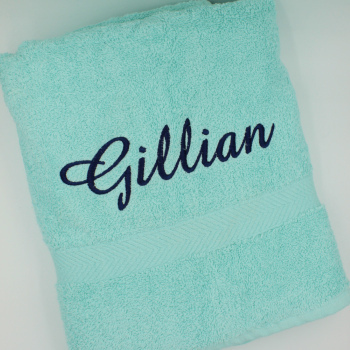 Stylish personalised mint green cotton bath towel a unique and useful gift for yourself, the family or a friend. This bath sized towel is 100% ringspun cotton. This towel looks great in the bathroom and is also a very popular gift for anniversaries, birthdays and Christmas too! Personalised with your choice of name, nickname or initials. Embroidered in a letter font style and thread colour of your choice. 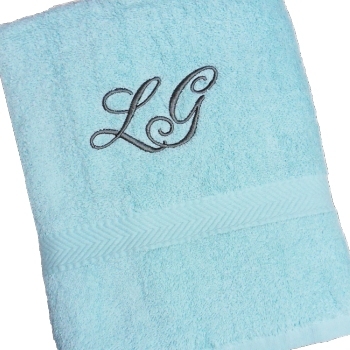 Amys Gifts will embroider this towel especially to order - please allow about 2 days for dispatch.